This amazing wedding inspiration at William's Fruit Ranch came together through a collaborative effort of some amazing vendors. Using a poem as her inspiration, Heidi Wight of Ira and Lucy Vintage Rentals and Styling put together this elegant apple orchard photo using her own vintage rentals, stunning wedding gowns from Wedding Gowns by Daci and beautiful florals by Flowers at Will. There are so many gorgeous details in this elegant vintage wedding inspiration, so be sure not to miss a single one by perusing the full gallery here, all fabulously captured by Stephanie Mballo Photography. From Heidi Wight of Ira and Lucy Vintage Rentals and Styling:As I researched and started pooling ideas together that incorporated our furniture, accessories, floral design by my go-to Flowers at Will botanical stylist, and local wedding gown designer, Daci - I stumbled upon a poem by Horatio Alger that I felt so perfectly stated the vision for what Stephanie, Will and I were dreaming up! Continue reading for the full 'Apple Blossoms' poem by Horatio Alger Jr that inspired Heidi when designing this wedding inspiration. 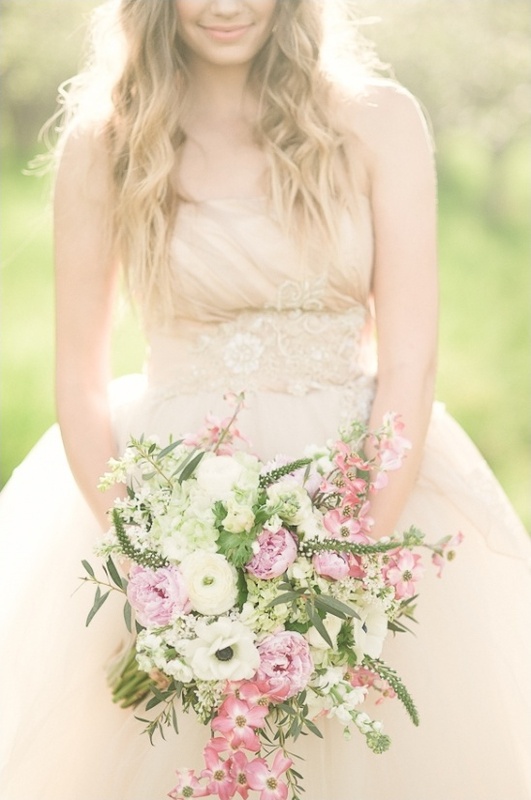 From Will Heatter of Flowers at Will:The flowers that surround a bride on her wedding day should never steal the show, but rather compliment her beauty and enhance her elegance. I chose Lilacs, Peonies, Ranunculus, Hydrangea and Dogwood Blossoms for that very reason. I played off the apple orchard setting and went country chic. The bride’s beauty was softly, yet deliberately stunning, so I accented that with soft pastels, bringing in a deliberate pop of color. The arm band of flowers was as unique as the bride was breathtaking. The fresh idea was an elegant play on the eternal wedding concept: the simple band of Lilacs and Dogwood Blossoms continued in a circle with no end, ushering the bride into a marriage with just as much promise. 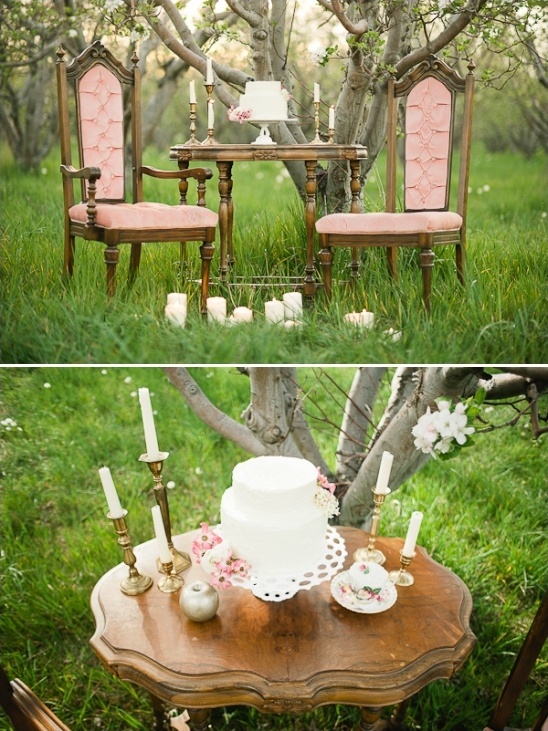 From Heidi Wight of Ira and Lucy Vintage Rentals and Styling:The William's Fruit Ranch in Emmett, ID established in 1890, set our perfect backdrop. 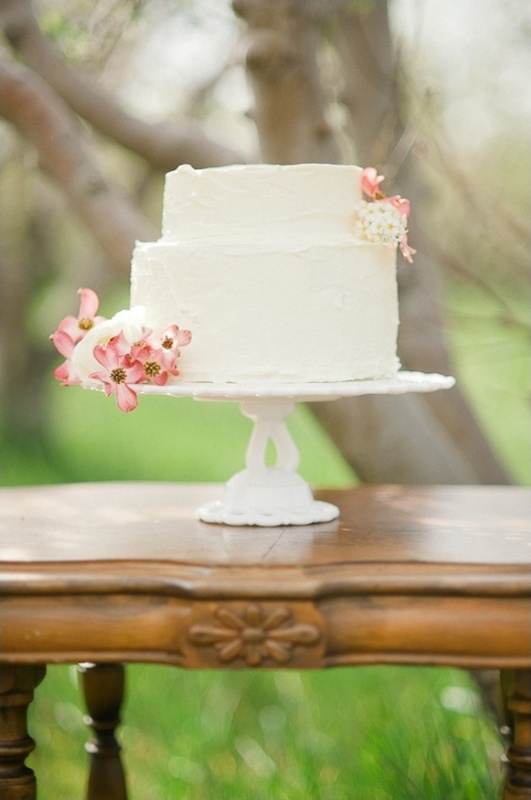 Our goal was for simple elegance, utilizing the natural beauty of the apple-boughs. The stage was set with hand-selected items from our vintage rentals inventory, pulling in the warm wood tones, soft pinks and gold hues. 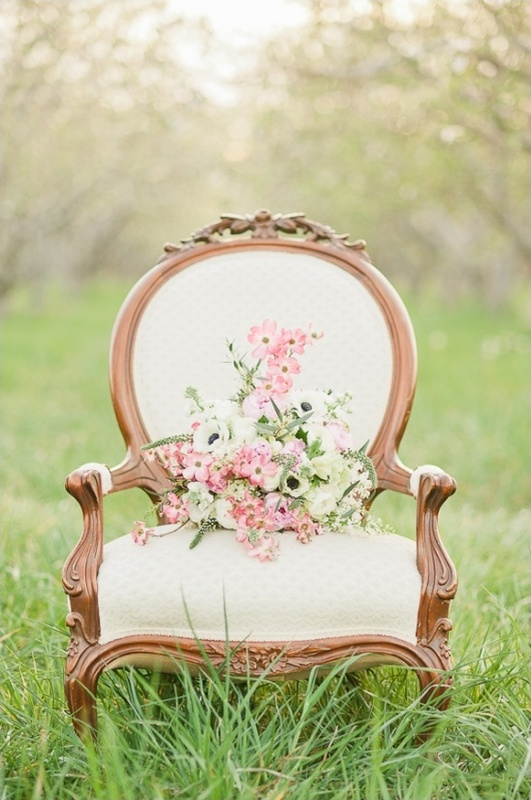 I added some DIY elements to the shoot – spray painting an apple in a soft pearl gold tone, which matched the ornate frame. Read on for the full 'Apple Blossoms' poem by Horatio Alger Jr! Apple Blossoms I sit in the shadow of apple-boughs, In the fragrant orchard close, And around me floats the scented air, With its wave-like tidal flows. For is not this the rare, sweet time, The blossoming time of the year? I lie on a couch of downy grass, With delicate blossoms strewn, And I feel the throb of Nature's heart Responsive to my own. I can see, through the rifts of the apple-boughs, The delicate blue of the sky, And the changing clouds with their marvellous tints That drift so lazily by. Oh, is it not a rare, sweet time, The blossoming time of the year?